Something special is on the horizon for Maple Creek’s Grotto Gardens Country Market. Beginning in June, the Saskatchewan Tourism Award nominee will be providing guests a new way to interact with the business’ miniature goats. Grotto Gardens will begin yoga lessons this summer, though there is a twist. The lessons will be done in the company of goats. The idea of goat yoga was introduced to owners Dana Hassett and Dan Sellinger by their neighbour Lana Major. “She sent me a video of it last year. I watched it and laughed like everyone does, but I didn’t think much more about it,” Hasset said. The idea began to take shape months later when Hassett and Sellinger attended a workshop with Tourism Saskatchewan about thinking outside the box for program development. “It just kind of came to me; goat yoga. Everyone there just loved it,” Hassett said, adding the idea took off from there. The first ever goat yoga course in Saskatchewan is paired nicely against the first ever goat walk in the province. After the first season open Hassett says she took notice of how the goats interacted with the visitors coming to the new business. “They would say they were here for their goat therapy … I guess it just made them happy,” Hassett said. Goat yoga is not a new enterprise. The program started in the States. In Oregon, Lainey Morse began the now very popular program at her farm. Now there is a waiting list of at least 600 people, to take a lesson. The experience expanded and can be seen in various states across the U.S. and has made its way into Canada. “There is a place in Kelowna that does it as well. I wanted to give it a try when I was out in British Columbia earlier but it didn’t work out for me,” Hassett explained. The classes will be taught by Ceara Caton and Lou Ellen Murray of Sun Dog Yoga in Maple Creek. The classes will be twice a week, on Thursday and Sunday, beginning in June. “Ceara and Lou Ellen looked at their schedules and that is what worked for them,” said Hassett. If the program takes off, it is possible to add more lessons throughout the week, depending on the instructors availability, according to Hassett. To accommodate the yoga space Hassett and Sellinger are building a Yoga Barn near the grotto the business is named for. Goat yoga is regular yoga done in the company of goats. Hassett said there isn’t any special training needed before going to a class. “The goats will just be there and be their curious selves. They may climb up on your back in downward dog or snuggle up beside you when you are laying down,” Hassett explained. Moving forward Hassett said she would like to move away from the class be known as just “goat yoga”. As Grotto Gardens gains more animals she would like it to be known as the Yoga Barn because there will be more than just curious goats in the barn. “Who knows maybe next year we will call it bendable bunnies,” Hassett joked. 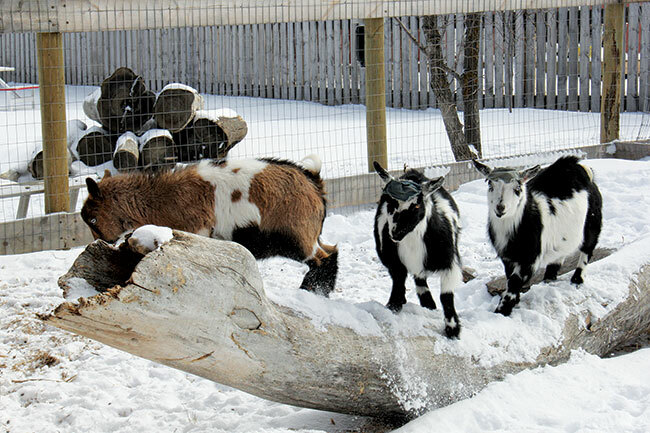 Grotto Gardens has expanded the animals on the property over the winter. Along with the goats the property now also boasts three miniature pot bellied pigs and two miniature donkeys along with chickens. There is only space for 20 participants in each class, and Hassett said there have already been sign-ups. “I just had two people from Winnipeg sign up for a class this summer,” she said. Registration for classes is now open with the first class beginning June 4. Each class begins at 11 a.m. The classes run one hour and costs $18. For those looking for a little extra, Grotto Gardens can also provide a “healthy prairie lunch” with the class for $30. Those looking for a souvenir can purchase a package that includes all of the above along with a yoga barn T-shirt for $60.